White on cream is elegant, but difficult to photograph. This close up photo is a bit washed out to highlight the white tree. Stamped the trees in Hero Arts Unicorn, a white pigment ink, on cream card stock, and let it dry. 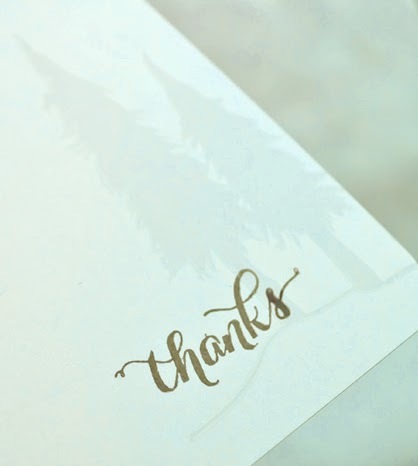 I stamped the sentiment in brown over the tree and colored in a bit with a marker, as the white ink washed out the "s" in thanks. I have a thing for flat note cards....and always use the heaviest card stock I have on hand, particularly when it is a one layer note card. Amazing how such simple design can speak volumes. Your card is stunning!!! The white, cream and brown are all so beautiful together Joan. PS. 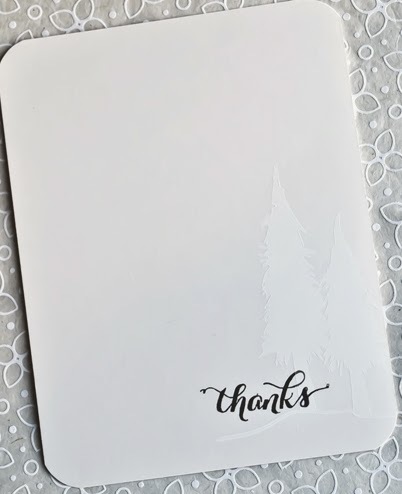 Your photo of the card came out great. Love this card and I am glad you explained that there was a tree... so I looked more closely and do see it. Also wanted to say congrats on the miles today and yesterday. I noticed your widget and think you are AWESOME! Keep Up the hard work, you are worth it. thanks for the comment on the walking. I either get sick, or hurt my back or something and it gets me off the treadmill but I am now back. One step at a time! So glad to have found you again, I loved your other 2 blogs and have missed you. I totally "get" where you are in life. I have "been there, done that" with Mom and after a couple years of beating myself up and down one way or another I am just now getting back to the business of real life. There are more good days than bad and my creative side is coming back which is wonderful. I am looking forward to playing in my room again. I have discovered that after a couple years off my tastes have changed so I see a purge coming in the near future. But that is ok I am ready for it and embrace it. Change can be a good thing. I cant change the past nor should I. My mistakes made me who I am today and will be tomorrow, hopefully, a better person. I'l be casing this for sure! So simple and elegant. And I hear you on thick cardstock - makes it feel 'substantial'!